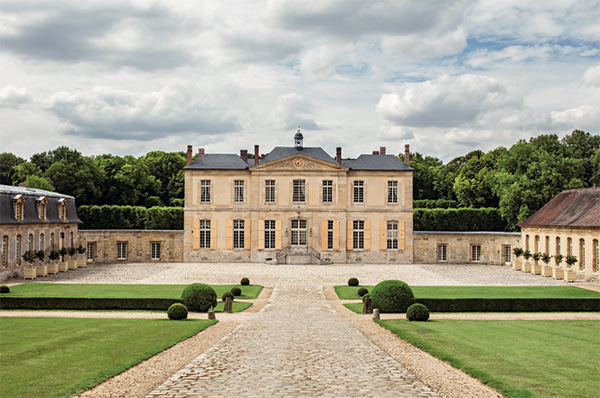 You are not going to believe your eyes when you see the breathtaking mid-seventeenth-century chateau outside of Paris that I am about to show you…. 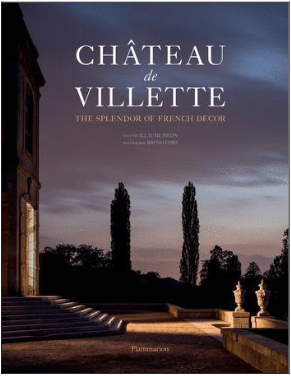 Chateau de Villette- The Splendor of French Decor, written by Guillaume Picon and photographed by Bruno Ehrs, is one of the most beautiful books on French decorative arts and design that I have ever seen. The history of both the chateau and its owners is fascinating, and its thoughtful restorations have ensured a consistent place en vogue. Original construction took place from 1663–69, with architecture attributed to Francois Mansart and his great-nephew, chief architect of Louis XV, Jules Hardouin-Mansart. At this time, new chateau styles were developing as practical or strategic military elements were no longer necessary- opening the way for Le Notre to design elaborate gardens and outdoor vistas. The extravagant interiors reflect the then-new mindset of the Rococo era – designed with more permanence and elegance. 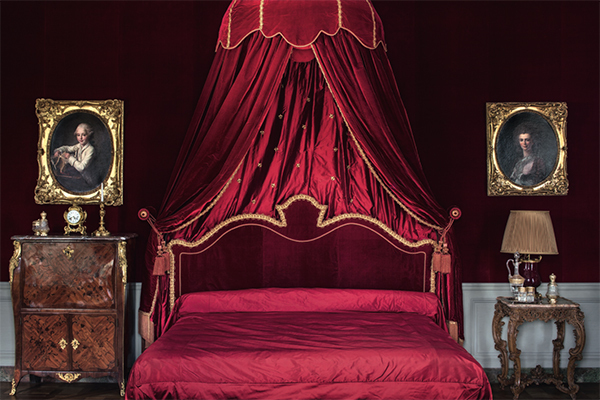 Bedchambers, previously ceremonial, were designed be private spaces of comfort in the eighteenth century. Tables were no longer brought to the bedchambers for dining. 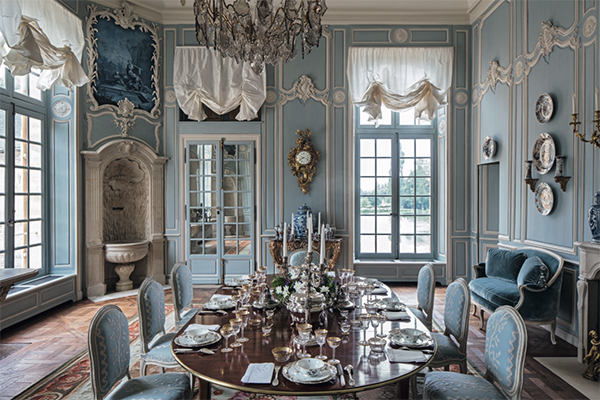 Stand-alone dining rooms were an eighteenth-century innovation, and in Chateau de Villette is the first formal dining room in a French chateau. Celeb Worthy. 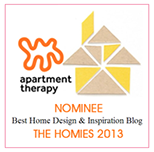 Did you know…. that high profile people such as Thomas Jefferson, Benjamin Franklin, and Thomas Paine spent time at the chateau? Owner Sophie de Grouchy and husband Marquis de Condorcet were leading political actors of their era. They hosted some of the most intellectually influential salons of the pre-revolutionary period for an international elite. that Chateau de Villette was the backdrop for several notable movies and television series which include Tintin and The Golden Fleece (1961), the Nicolas Floch television series La Mante, and Dan Brown’s The Da Vinci Code (2006)? In 2011, the chateau acquired it’s newest owners, who commissioned Jacques Garcia to restore the house and gardens to their idyllic former glory. The aim was to recreate the atmosphere of high-end eighteenth-century France through a blend of Louis XIV, Louis XV, and Louis XVI vogue. The result is breathtakingly historical yet current. 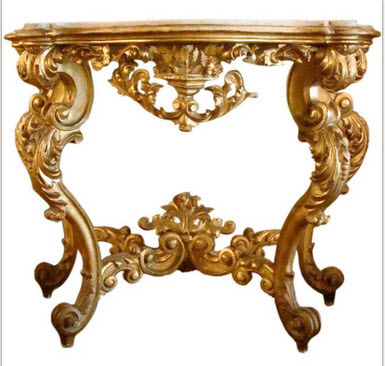 Rococo curves artfully mix with Louis XVI straight lines and restraint. The textiles are spectacular- all tassels, braids, and brocades are made by hand. Bathtubs are carved from solid blocks of marble or onyx. 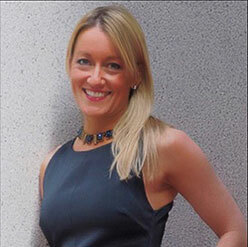 Furniture and art are signed originals, and in some cases of royal provenance. Shown above: the main apartment, and my favorite room in the Chateau. The canopy is in silk velvet with individually embroidered fleurs-de-lis in gold cannetille work. The bed is flanked by aristocratic images: Portrait of the Marquis de Briges, aged seven by François Hubert Drouais (1727—75) and Portrait of a Woman by Louis-Roland Trinquesse (c.1745—c.1800). The pages devoted to this room might transport you to a different time and place for a good while. The details are many, and they are jaw-dropping. 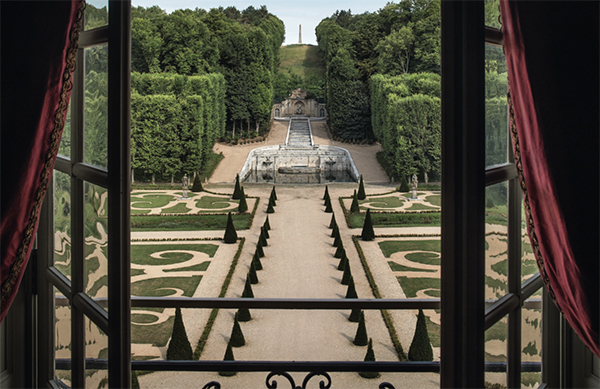 Following the principles laid down by Le Nôtre, the gardens are laid out on symmetrical and geometrical lines and offer an uninterrupted vista to the horizon. This is the view from the main apartment shown previously. The aged panes of glass in the French doors serve as a reminder to the age of the chateau. Can they possibly get any better with color, and don’t you feel like this could be a page of Architectural Digest? These rooms are historical yet fashionably current. The silk damask of the bed canopy matches the wall hangings, as was the fashion. Above the bed hangs a painting of St. Agnes by Charles de la Fosse (1636—1716), a pupil of Charles Le Brun (1619—90). The newly restored orangery of the Château de Villette. 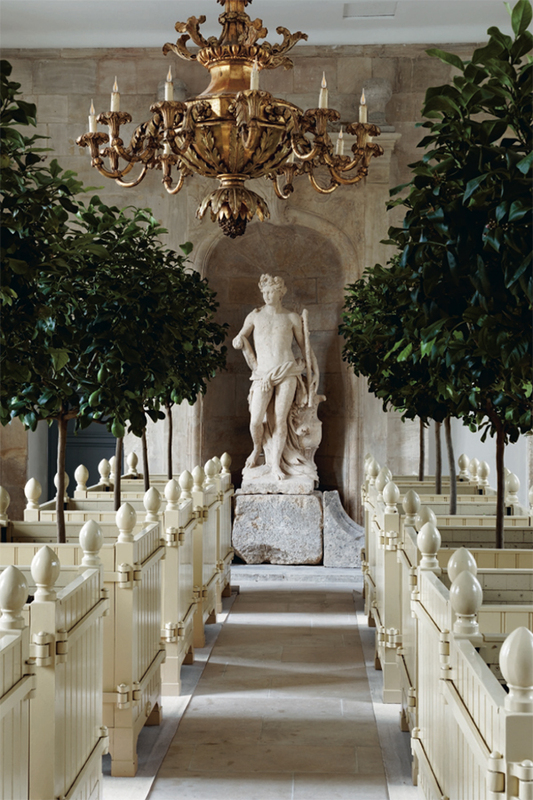 Jacques Garcia restored Chateau Villette salons in Louis XIV, Louis XV, or Louis XVI style, furnishing them with authentic pieces including some of royal provenance. Shown above is a rare eighteenth-century escritoire inlaid with tortoiseshell, Indian ebony, and copper and a collection of eighteenth-century leather-bound volumes stand on a writing table inlaid with rosewood, kingwood, and satinwood. Dining rooms were an eighteenth-century innovation in French country houses. The dining room opens off the entrance hall. The remarkable rococo decorative scheme in the dining room, carried out in 1747—48, is a unique example of its kind in France. The room shown above is the first formal dining room in a French chateau- a surviving masterpiece of the Rococo era and a beautiful example of chinoiserie style. The book shares details of the dining room’s unique architectural features that you won’t want to miss. 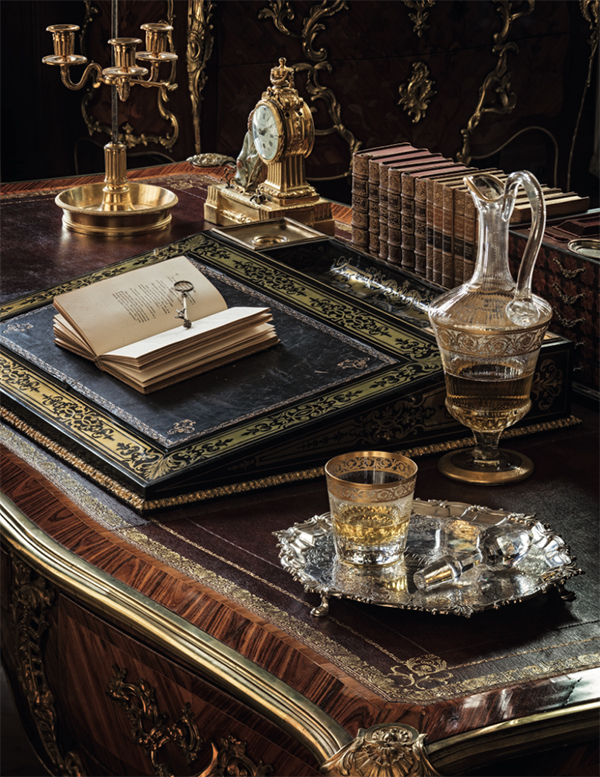 This Louis XVI mahogany table is set with Christofle silver, Saint-Louis crystal and fine porcelain patterns of eighteenth-century. The corner water fountain was designed to keep refreshments cool. Rococo decorations, Imari porcelain, and Chinese scenes in rococo cartouches continue around the room. This book should be required reading for all designers, design students, decorative arts enthusiasts. This chateau is furnished with original pieces and carefully recreated period fabrics, which would seemingly make it a decorative index fossil – yet nothing about it feels dated. Over two hundred and fifty photos prove that elegance is timeless. This book is a must have and a great gift- order your copy here. Serial rights are available for Château de Villette: The Splendor of French Decor. 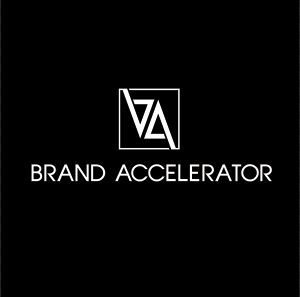 To arrange, please contact Ron Longe @ 212 387 3410 or rlonge@rizzoliusa.com. 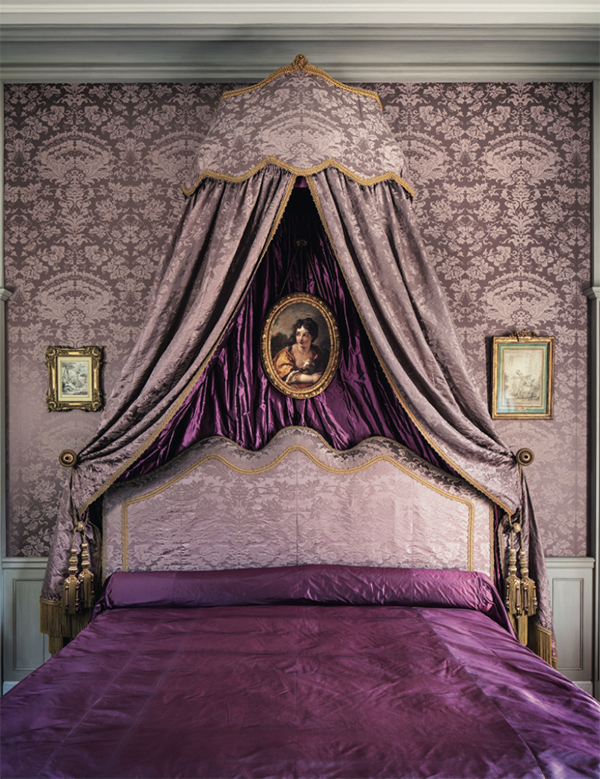 ©Château de Villette: The Splendor of French Decor by Guillaume Picon, Flammarion, 2018. Images, which may not be reproduced or transmitted digitally without written permission from the publisher, are to be credited on a case-by-case basis.